I have many, many things to be thankful for and know I have been blessed beyond measure. I have a great family, make a comfortable living doing what I love, and have a strong faith in God. I don't know if there are enough hours in the day for me to fully count my blessings and name them one by one as the old hymn instructs. Other than trying to list all the things I'm thankful for on this blog post, I'll simply give you one that's proved to be very important today. I am thankful that our farmhands (and my brother-in-law) wanted to come work on the farm this morning. Otherwise, my dad and I would still be trying to dismantle and remove this old, collapsed roof off of the cows' feed trough. We spent several hours on Wednesday tearing out the old wooden trough underneath this roof and replacing it with the concrete bunks you see in the photo. The roof's bracing was weakened in the process, but we thought it would stay in place until we could tear it down next week. We were wrong, as the photo clearly shows. 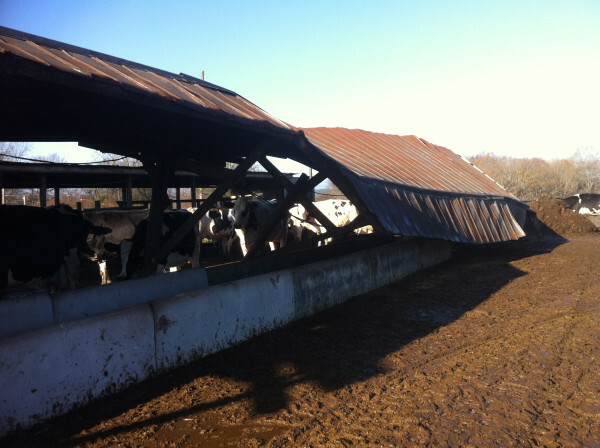 Luckily (or "thankfully") none of our cows were injured when it fell last night. It took the five of us about two hours (and two tractors, three chains, a sledgehammer, crowbars, and a chainsaw) to break the roof into pieces and clear it out of the way. I hope by this time tomorrow I can be thankful for no flat tractor or feed wagon tires due to old nails that we might not have gotten up. Before I sign off, I'd be remiss if I didn't mention one more thing I'm thankful for, and that's all of you. Thank you for being interested enough to read about what happens on my family's farm, and more importantly thank you for your overall support of American farmers. May God bestow his richest blessings upon you and your family, today and always. Happy Thanksgiving!